How early do I need to make a reservation? We would recommend that you contact our sales staff as soon as you are prepared, to ensure the best availability for your event date. Some dates fill months to a year in advance. All the rental items we carry are on a first-come-first-serve basis, so it is in your best interest to reserve early. A non-refundable deposit equal to 30% of your total order is due in order to make a reservation. Now that I have an order, am I able to make changes? We will do our very best to accommodate any alterations to an order up until the delivery day. Any additions are solely based on availability of products, and removal of any previously reserved items may not result in a refund; they may in fact result in a restocking fee. Please contact us as soon as possible with any alterations to your order to ensure a smooth delivery and/or installation. When will I receive your tent installation or delivery? Undercover Tent typically delivers Wednesday to Friday for any Saturday or Sunday events, and will do pickups on Monday or Tuesday. Arrangements can be made for a Sunday pickup for an additional charge. Our sales staff will contact you the week prior to your scheduled event, to confirm delivery and installation times. We do our very best to accommodate specific delivery schedule needs, however we cannot guarantee this. Please let our sales staff know of any restrictions regarding delivery and pickup as soon as possible; this may impact availability and pricing, as there may be an extra fee for any restrictions. What is included in my delivery? There is a delivery fee associated with all orders. The delivery fee fluctuates from town to town based upon distance and ease of access from our facility. In some cases, there may be an additional delivery fee if last-minute embellishments to orders can be accommodated or multiple trips to your event location were required. The delivery fee on the order includes a tailgate delivery and pickup only. Any additional movement of equipment or setup can be accommodated for a fee. Our delivery and installation personnel are instructed to neatly stack all items. Specific containers and racks are provided for china, silver, glassware, etc., to ensure that you receive your items neatly and that they are sanitized, undamaged, and table-ready. All rental items should be returned and prepared for pickup in the same manner in which they were delivered. For example, all rental items should be left under the tent (if applicable) to protect them from the elements. All china, flatware and glassware are required to be rinsed and repacked in their original containers, and all linens packed dry and free from debris in the supplied linen bag. Please have your driveway clear prior to our arrival for truck and personal access to your event site. If you intend on having your lawn mowed, please do so early in the week. Is your irrigation shut off? We certainly do not want your irrigation system to go off under your tent! We will call DigSafe on your behalf, however you are responsible for any private underground utilities such as, septic systems, pool filtration, irrigation or any other privately installed utilities. Please mark these areas of concern prior to our arrival. Underground electrical is not marked by digsafe any longer. It is the customers responsibility to be knowledgeable of the electrical location in the yard or to cover the costs associated with a private locator. 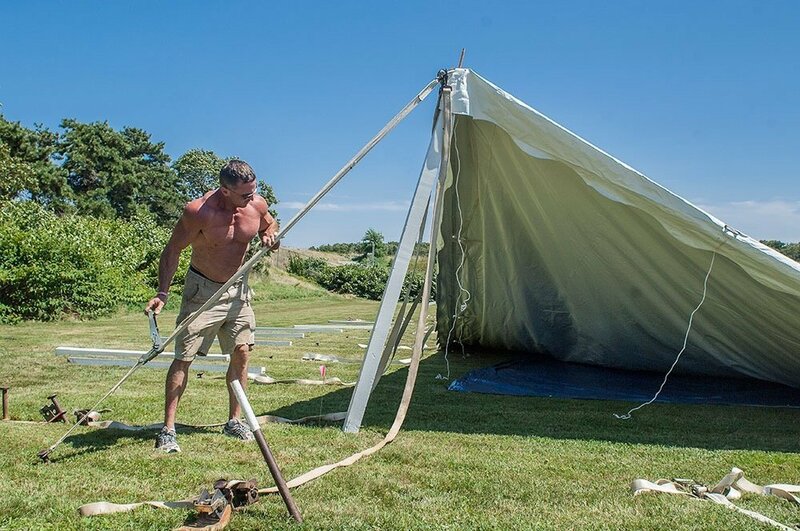 If we have not visited your event property in advance, and you are receiving a tent, please mark the physical location so our installation crew places the tent in the correct spot. If you have any electrical needs under your tent, please let us know the location of your exterior outlets for ease of access. Will you be excepting the delivery in person? Please note you do not need to be there, however please let us know where you would like your rental items delivered on the property. (Garage, back yard etc). Please note there may be additional fees associated. Please see our delivery FAQ for more information. If you are expecting a tent installation, your rental items will be placed under the tent according to the customized layout unless otherwise specified. Please inform us as to your plans for final payment and make the appropriate arrangements with our office. Please let us know when your event is to begin. When is your event completed and ready for pick up? The week of your event, a member of Undercover Tent staff will visit your property and perform a final tent site inspection. They will "map" where the tent will fall exactly on the property using a combination of flags and spray paint. Our installation team can then accurately drive stakes around pre-marked underground hazards, as well as insure your tent is installed safety, securely and perfectly tight. 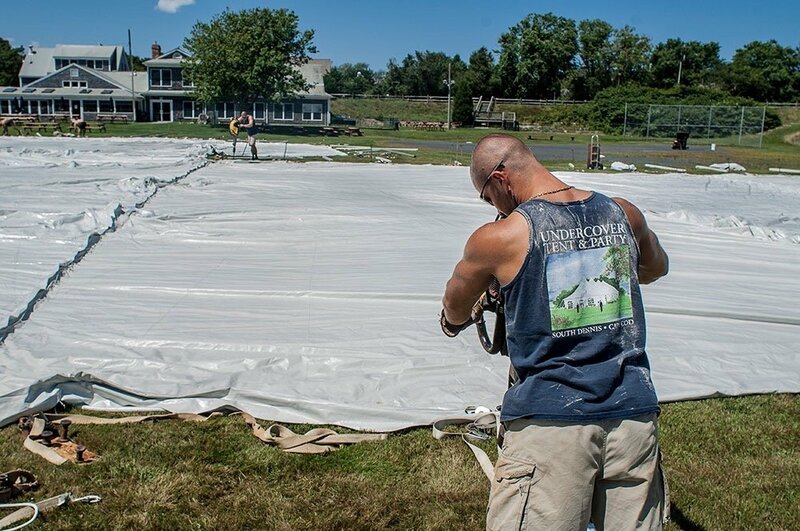 Once the tenting area has been designated, our installation team will use a drop cloth to prevent any dirt or grass from marking up your beautiful white tent top. Depending on the size of your tent, multiple tent sections may have to be connected to accommodate your guest size. These tent sections lace together to form one large tent top! 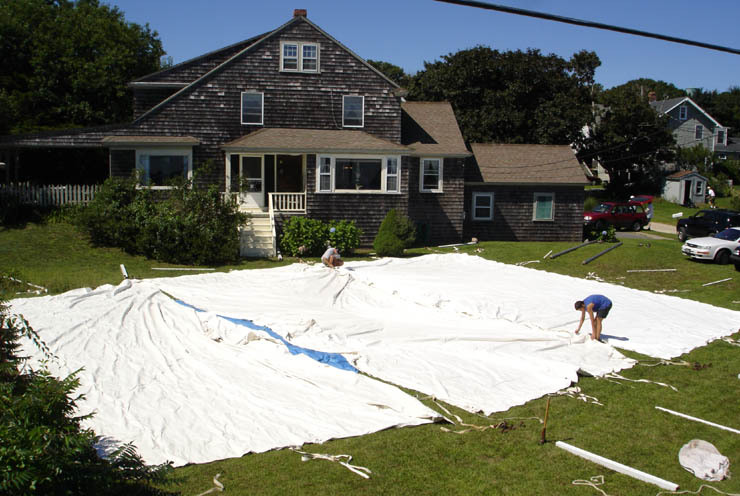 Once all of the staking is complete, and the tent is fully laced together, we begin putting legs around the perimeter, beginning with the corners and working are way around 360 degrees. After the legs are in place, the center poles are put in and lifted upwards! The tent is then tightened, fully inspected, and ready for the furniture to be placed underneath according to your custom layout. We will call DigSafe on your behalf, however, you are responsible for any private underground utilities such as septic systems, pool filtration, irrigation or any other privately installed utilities. Please mark these areas of concern prior to our arrival. Underground electrical is not marked by DigSafe any longer. It is the customer's responsibility to be knowledgeable of the electrical location in the yard or to cover the costs associated with a private locator. Will you be accepting the delivery in person? Please note you do not need to be there, however please let us know where you would like your rental items delivered on the property. (Garage, back yard, etc). Please note there may be additional fees associated. Please see our delivery FAQ for more information. Please let us know when your event is to begin, and when it will be completed and ready for pickup. The week of your event, a member of UnderCover Tent staff will visit your property and perform a final tent site inspection. 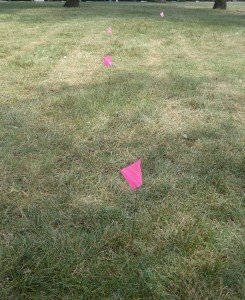 They will "map" where the tent will fall exactly on the property using a combination of flags and spray paint. Our installation team can then accurately drive stakes around pre-marked underground hazards, as well as ensure your tent is installed safety, securely and perfectly tightly. 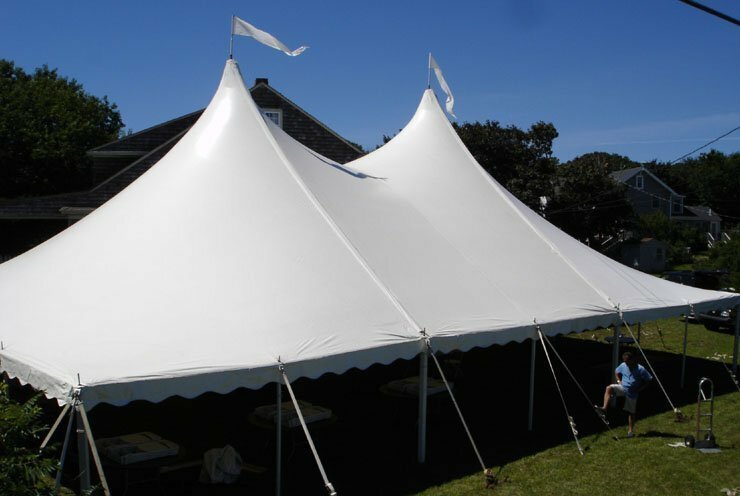 Once the tenting area has been designated, our installation team will use a drop cloth to prevent any dirt or grass from marking up your beautiful white tent top. Depending on the size of your tent, multiple tent sections may have to be connected to accommodate your guests. These tent sections lace together to form one large tent top! Once all of the staking is complete, and the tent is fully laced together, we begin putting legs around the perimeter, beginning with the corners and working our way around 360 degrees.